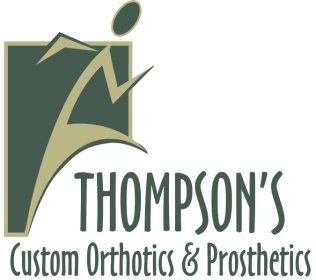 Thompson's Custom Orthotics and Prosthetics is the only company in Eastern Washington to have this technology and we now have the transfemoral tank available! Consistently give your patients comfortable, well fitting sockets while significantly reducing/eliminating the need for cast modifications and multiple check socket fittings. Available exclusively in North America through Cypress Adaptive. Socket fit is vital to the comfort, suspension, control, and acceptance of a lower extremity prosthesis. The biggest challenge for the practitioner is to consistently and accurately capture limb contours and tissue displacement as they would be under load. With traditional, non-weight bearing casting methods, it is impossible to accurately capture a limb under weight bearing conditions exactly as they would be inside a prosthetic socket. While casting with the Symphonie Aqua System, optimal hydrostatic pressure is applied to the limb while in full weight bearing. The individual’s body weight and tissue contours under weight bearing can then transfer perfectly and evenly to the casting material, thus capturing an impression that accurately reflects the limb under full weight bearing conditions. The full contact and weight bearing that the patient experiences during the casting process also provides excellent proprioceptive feedback to the patient who can then give the practitioner valuable information concerning bony and sensitive parts of the limb before the socket is made.